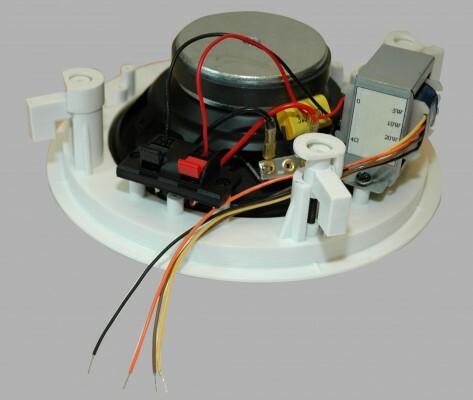 If you want to install In-ceiling speakers or In-wall speakers in hotels, schools, churches or restaurants it is often much easier to use Line Speaker System. The most common way is the 100 V system. It is a ”constant-voltage-system” where the amplifier is equipped with a step-up transformer which increases the normal voltage output up to 100 Volts. The main difference between a low impedance speaker system in 4 or 8 ohm is the way the individual loudspeakers are connected to the amplifier. In a convetional low-impedance system you must connect the speakers in series and parallell in a way to maintain the correct impedance for the amplifier. In a 100 Volt line system, a large number of single loudspeakers, each equipped with a step-down transformer, can be connected to one single speaker cable. Each speaker must be equipped with a step-down transformer. This TR100 have multiple tabs, 5W, 10W and 20W to match the desired power level to be applied to the loudspeaker. 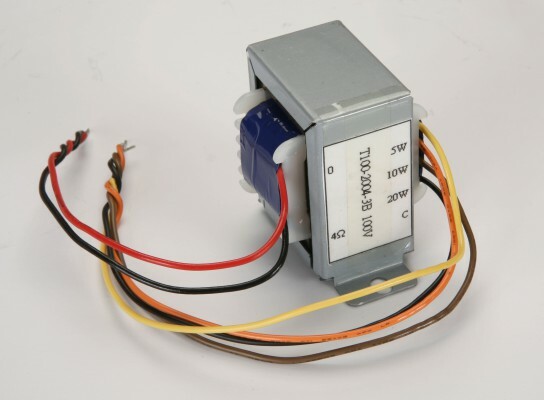 All the loudspeakers step-down transformer primaries are connected in parallel to the constant voltage line.Fits for direct frame mounting on IC621, IC624 and IC824.